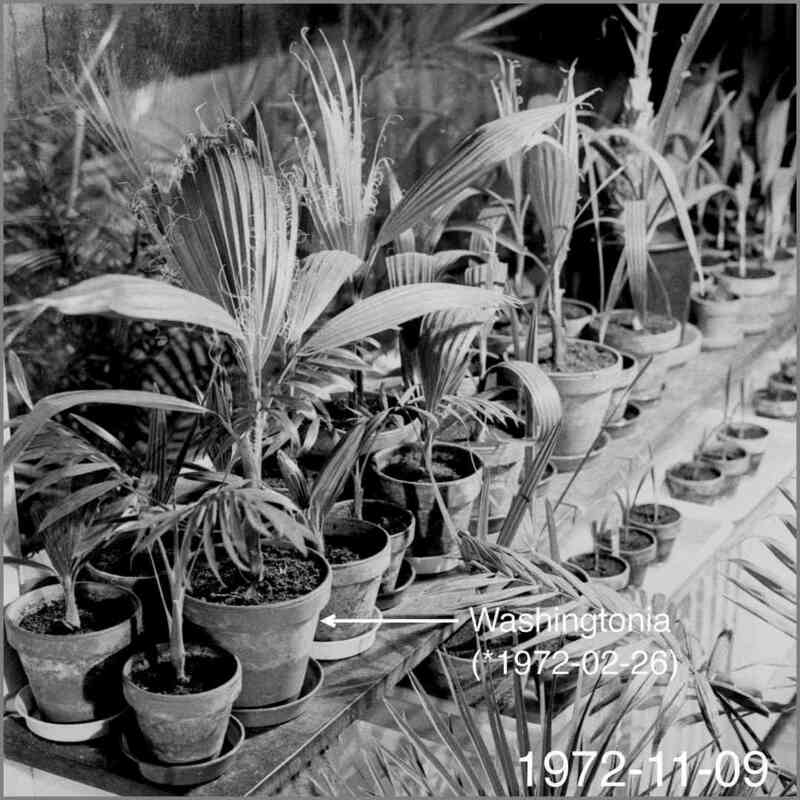 Please help, I have three Washingtonia Robusta, I have researched online as much as I can but am seeing so much conflicting information. 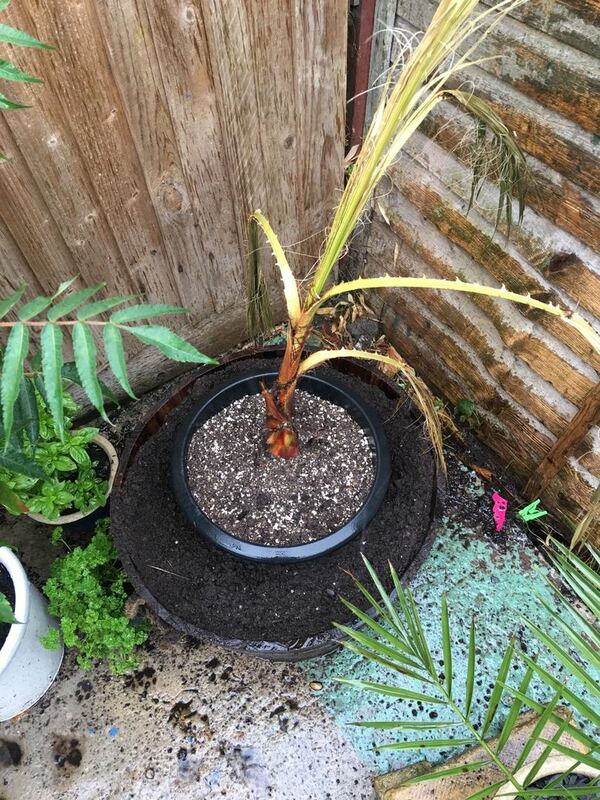 I brought 2 Washingtonia Robusta or mexican fan palms, and one pot had two growing in one, so I hosed down the root ball and untangled the roots and re potted, the two I split are in smaller 36 cm pots, and one I put into a large 60 cm barrel pot. They came 100cm in height, and looked nice and healthy. as soon as I re-potted them they immediately flopped over and the fronds all closed up. the soil mix I looked up and mixed john innes no.3 and half all purpose compost, which was what recommended on a video I watched. I got a bag of miracle grow enriched compost , which I have since found out can give the roots burn due to slow realized fertilizer in the soil. the plants are looking really bad. I don't have a clue what to do, I read something that it could be transplant shock so bare with it, somethings saying to water it every day some saying to let the soil dry. Please any advise would be really appreciated, Just want them to be health as possible. I am in the south of the UK so the climate should be fine for them until winter when I was plant to bring them in the house. Thanks for the advise will have a look now and try and improve soil , the wooden pot has one hole at the bottom I put a load of crushed up plastic pots at the bottom as well to help with drainage, might be worth drilling some holes in the bottom to then. better soil and more drainage holes I will try then deffo want to make sure I get it right as wasn't sure how well they responded to being re-potted. Any idea how often i should be watering them in this state if i get the drainage better? I did the same thing. I put mine in too large of a pot and over watered. This smothered the roots. Your pot is too large and your soil looks like sludge (this must be my day for sludge). And you are probably overwatering esp. as you are fast heading into winter. Ditch the compost and add things to improve drainage, i.e. perlite or something like that. Pal Meir knows all additives in Europe to improve drainage. I've grown many of these from seed, and I can confirm that the soil they're in right now will kill them for sure. This soil mix is forcing the water up to the root ball causing root rot. In a natural draining environment, the palm will seek water in the ground with its roots down into the ground until it finds water. This is why you need a fast draining mix for the roots. 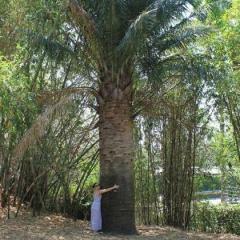 In so doing the palm can regulate its own water needs. 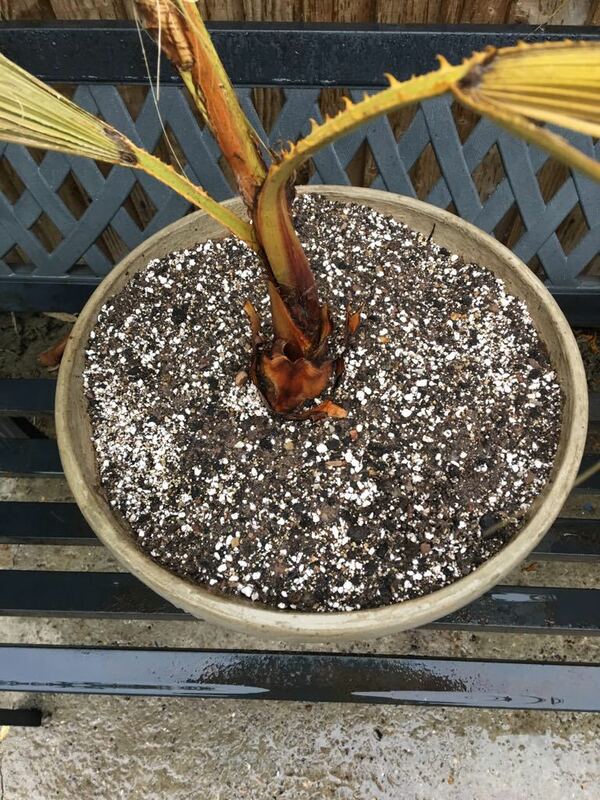 What I recommend, as these palms need a lot, and I mean a LOT of water, is to replace the soil with 100% Expanded Clay Pebbles and place in a saucer filled with 2-3cm of water depending on pot height (put a little bit of liquid palm fertilizer in the water). Living in Belgium, my climate is similar to yours, and this has worked well for me. 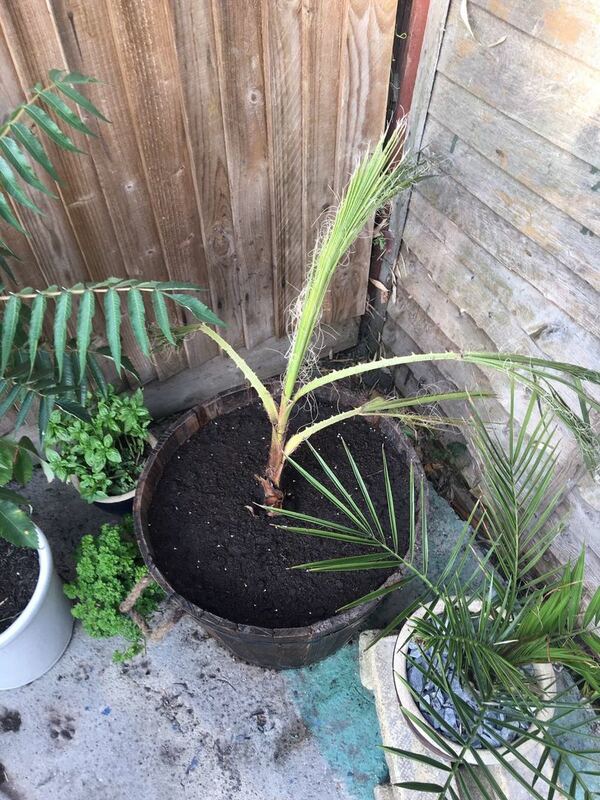 When the palm picks up, you can switch to a soil based mix with bark, perlite etc. Thanks for the knowledge and advise everyone very helpful, l really appreciate it! I have moved into smaller pots now and made a better soil mix up from soil mix recommendations on this forum. Pal Meir great pictures, wow they can really grow pretty big in small pots! do you think this pot size and mix will be okay? Its raining hard today and is at 18*C, In the state that they are in the pictures below with the new mix how often should I be watering them do you think and would it be helpful to bring them inside until they look a bit more healthy? Maxum2610, I have only just seen the message or would have tried that first, do you think its worth getting palm fertilizer and giving them some in there pots ? From what I see (and I don't want to be unkind), I believe you've traded one sludge for another. Um, why is one of your repotted Washies sitting in a larger pot of sludge? The sludge negates any benefits of the repot. Also, no fertilizer until at least next spring, assuming your palms live until then. You will soon head into winter, not a time to be fertilizing. Throwing fertilizer is not a fix-all for palm problems and may cause many of them to get worse. Not sure which repotted Washies you're refering to? These have been sitting in those pots since they were little seedlings. The ones on the left in the third picture are not Washies, but Livistona chinensis. All these small palms are sitting in a mix of pine tree bark and expanded clay pebbles. The bottom 1/3 of the pot is filled with only expanded clay pebbles so the water doesn't seep up to the root ball. I think this can hardly be called sludge. These plants, as you should be able to tell from their size, are many years old, and yes, always standing in water. 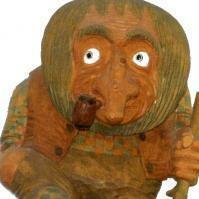 I fail to see why, after all these years, they should suddenly decide to start to rot and go "belly up" as they say. Also, I'm not sure if you're expecting an early freeze where you are, but here (and in most parts of the UK I should think), we have at least 2 months of decent weather left (assuming no freak weather fronts). And possibly more with a bit of luck. Seems to me plenty of time for some more fertilizer, as I've always done. By the look of the palms I don't think they mind, do you? As to the standing in water bit: I know that all of us have been told from an early age on, that leaving your plants standing in water is a no-no. They will die for sure. Surely a misconception propagated by a pre victorian botanist who didn't know the difference between a daffodil and a palm tree. Point is, all plants are not the same, and you well know palm trees are more closely related to grasses than to actual trees. That being the case, many of these can be safely left standing in water without any adverse effects. In fact I've even found it to be beneficial in that water is an excellent temperature buffer. Point of this all is my advice to Brad1234565 is simply this (again): use a smaller pot and fill it with something that won't absorb the water all the way to the root ball (see previous post). If my methods offend you, too bad. I believe that the palms in the pictures speak for themselves. And then you haven't even seen the tropical ones in the green house (some of them also standing in water ;). By the way Brad1234565, if you want some Washi seeds, let me know I have plenty. Always good for some experimentation. @maxum2610, maybe I misinterpreted what I saw or looked at the wrong photo. Thanks for the advise your palms look great, nice pond too! I have just ordered some of the expanded clay pebbles, will try them in a taller small pot, cant seem to find any taller pots on amazon, I can check store later on I will keep them in a tray of water as you suggest mixed with some fert. I have two types of fert ones generic house plant food NPK: 10.6:4.4:1.7 and the other is miracle grow 6-5-5 , Not sure whats better of if either is any good? I will try expanded clay 100% tall pots tray of water and liquid fert until they are looking alive again then switch to the "1/4 coco husk, 1/4 coco coir, 1/4 large size pumice (used for bonsai culture), 1/4 perlite." a good place to get the 1/4 coco husk, 1/4 coco coir, 1/4 large size pumice would a great help? Also would love some Washi seeds, that would be great! just really want to grow some nice big healthy palm trees. Tip: you could save a lot of money by using 1L or 2L plastic bottles (like Coca Cola), and make a lot of holes in the bottom, so that the water runs out immediately, Leave just enough bottom plastic to keep soil or Leca in. I use the 0.5L water bottles for Licuala grandis, Arenga engleri, Howea forsteriana, etc... cheap and effective. Tall yet small pots. Why? 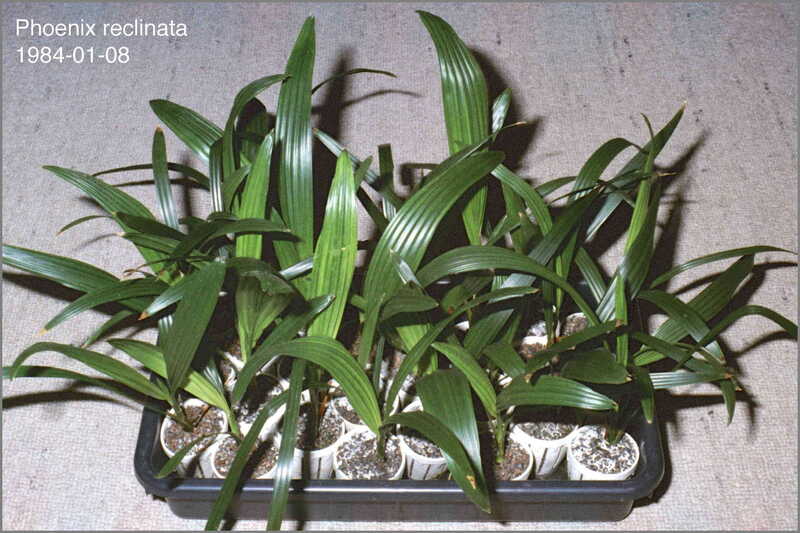 In a large pot water is difficult to regulate, so we use small pots, and repot as the palm grows. Tall pots are better, as the water sinks to the bottom, ensuring the root ball does not stay water logged. Coco husk could be hard to find or cost prohibitive. Else use Leca (Expanded clay), fine pine bark, lava, and such experiment and see what works for you. PM me for the seeds. Great, I will try the 1L & 2l bottle idea to save some money. I have got the palms in some smaller pots at the moment in 100% expanded clay sitting in a shallow dish of water so maybe they will come back. The soil wasn't the problem, it was the untangling of the roots that caused the setback. 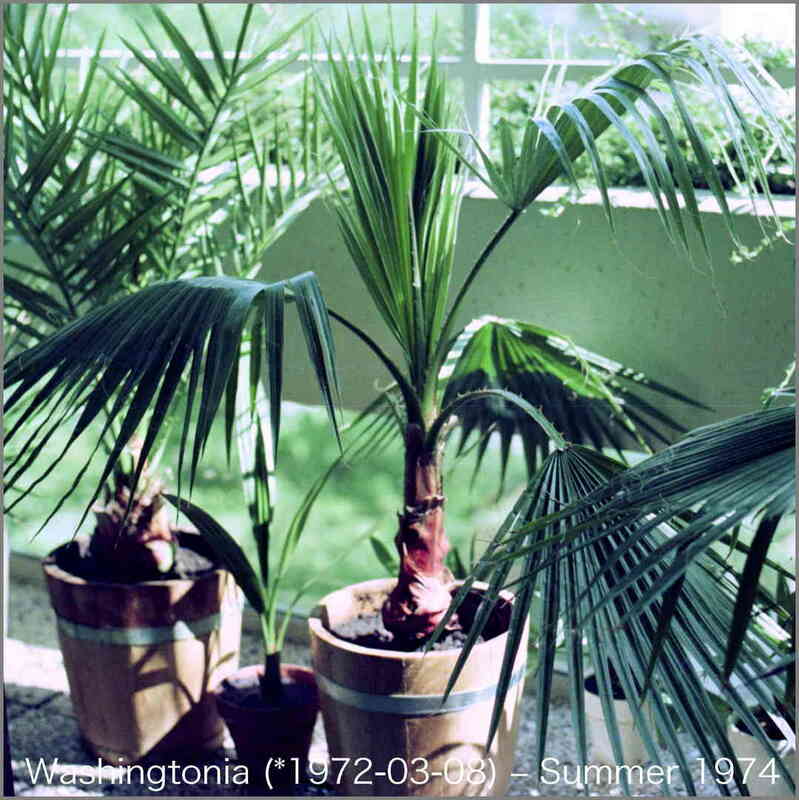 You can grow Washingtonia in just about any soil. Hi Brad1234565, how was your effort to have your palm. I have a similar situation. Would you share your result? Do clay pebbles help you with water under? My situation similar to yours except worst, I messed with the root, transplant shock. 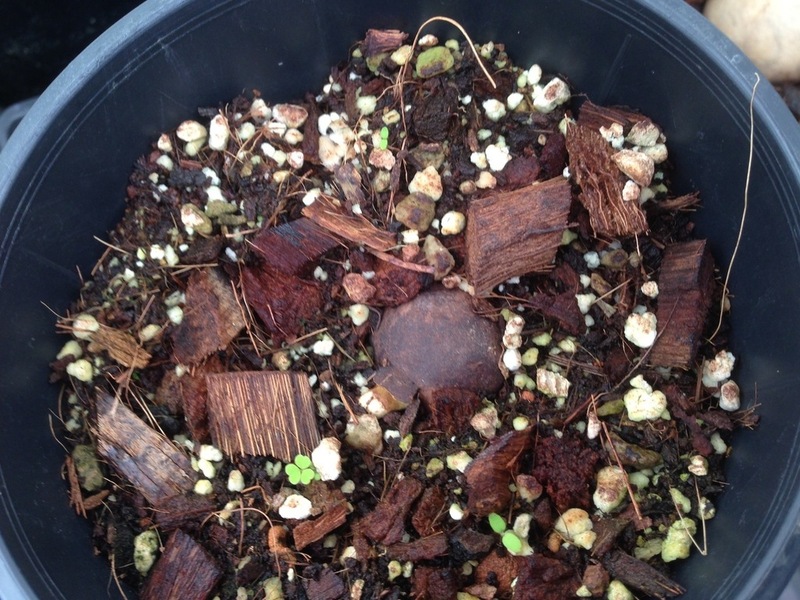 A commercial cactus/Palm soil mix with little drainage. Hi, I had three palms in this situation 2 Didn’t pull through one is saved I did the clay pebbles and water advise. I think it depends how shocked they were. Deffo worth a go. 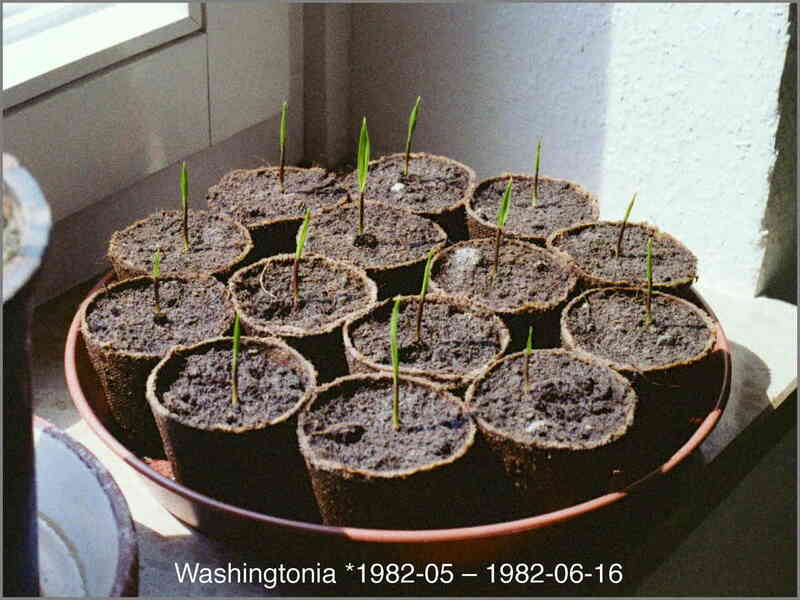 I was just wondering what the typical germination time frame is for Copernicia Baileyana. I have not found much information online, RPS etc. I have an 8'' community pot with 6 seeds in a plastic bag at room temperature (70-85F). Would these benefit from a higher heat? I have been following the forum as a guest for quite some time now, so it's nice to finally have an account and be with you all! I'm reaching out because I'm having a slight issue with my family's 40 yr old date palm. It's been healthy and growing well for many years with little to no maintenance but in the last two years it is struggling to hold onto new leaves and I can't work out why. The area around it was repaved about 8 years ago but it has only been looking poorly for 2/3 years now. The new leaves look healthy initially and very quickly appear slightly burned at the edges, then it doesn't take very long for them to dry out and wilt. Really don't want to lose this guy as he is the pride and joy of the neighborhood. Does anyone have idea, what it might be? Fungus, Bugs, Growing Conditions? I'm no expert so it may be something obvious I have missed. Is there anything I can do? Just recently I have broken up the pavement surrounding the base of the trunk to ensure it isn't missing out on water (which it very rarely gets due to climate). Anybody have any suggestions that might save my tree? My 40ft Royal Palm (Satellite Beach, Florida) was struck today by lightning. The new shoot/spear blasted apart all over the yard and there's an exit hole(s) at the base of the tree. Other than that, the tree looks fine. Does anyone have any experience with their palms getting struck? Could my palm survive? Is there anything I can do to aid in it's chances to pull through? Fertilize? Thanks. 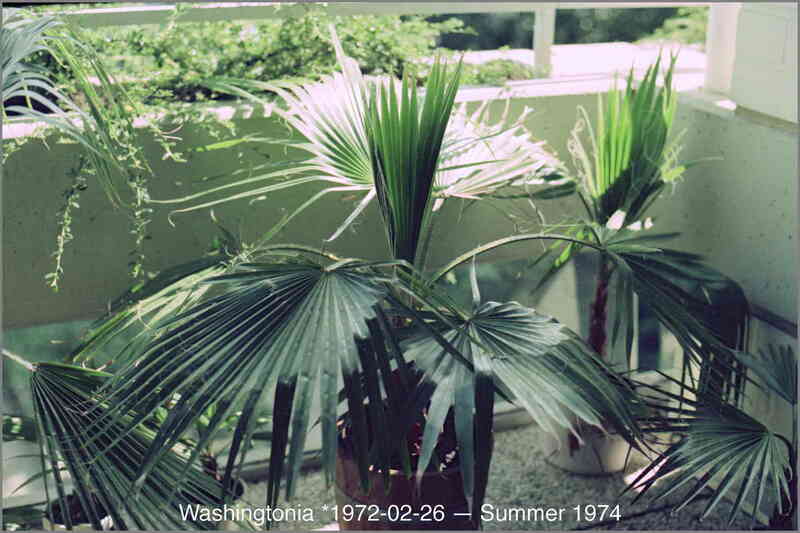 I live in the Dallas TX, USA area and have 2 Mexican Fan Palms (aka Washington Palm, Washingtonia Robusta). One is about 12 feet tall and the other is 17 feet tall. Over the winter, I wrap them with Christmas lights and burlap around the bud. This past winter it got down to 9oF. The shorter palm is perfectly fine, but on the tallest one I guess I kept the burlap on too long. Because, when I unwrapped it, the bud was rotting and fell off. I could tell that new growth was occurring, so I thought it would be fine. By the time I realized it wasn't growing normally, it was 1.5 months later. Two leaves that were already outside the bud grew out and are green. So those are mostly fine as you'll see in the pictures. But all the fronds that grew out after the rotten bud are deformed. 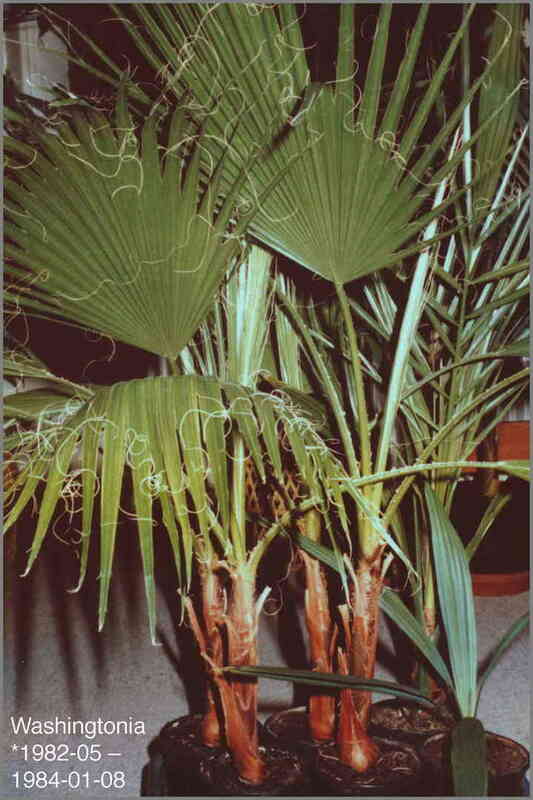 The new fronds are growing about 3/8 inch per day, but just are not normal. I've now applied copper fungicide one time and hope that eventually it's going to produce a normal bud. Below are several pictures showing what's happening. Any advice is appreciated. Here's the full picture of the Mexican Fan Palm with the 2 green fairly normal fronds that grew inside the burlap but outside the rotten bud which fell off 1.5 months ago. In this picture you see some of the deformed fronds that grew after the rotten bud fell off. Then, this picture shows one of the newest fronds. Finally, here's the newest frond in the center, which still doesn't look like a normal bud is forming. 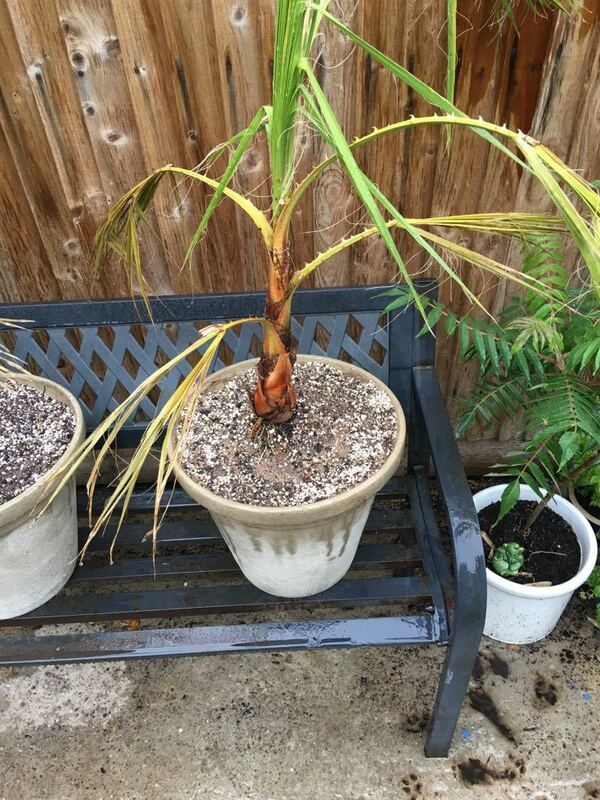 After a terrible winter, my Washingtonia robusta got beat up badly. Then at the very beginning of Spring, the spears pulled and I thought all hope was lost. But I checked it a few days ago and to my surprise I found this little bit of green. Today I inspected it more and found a new "stalk" coming up. It does not look that much like a spear, but at the top a little green frond shows. So I looked deeper with a flashlight and saw more life deeper down, but also bugs! I put some hydrogen peroxide down it (I have not done this for two weeks until now) and am hoping to kill off any pathogens that may harm it's new growth. Now, I will just have to wait and see what happens. It may end up just dying, or it may come back. In the pictures the green does not show well, but it is there and in person there is more than you can see in the pictures.